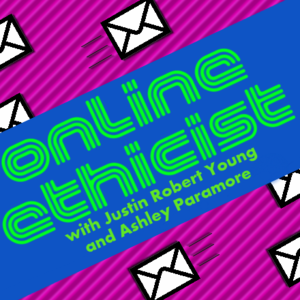 Online Ethicist is a podcast hosted by Justin Robert Young and Ashley Paramore. The show primarily deals with how people should go about social interactions on the internet. Topics frequently involve all types of social media from Facebook and Twitter to instant messaging and e-mail. They record their episodes live on their Justin.tv feed (on Wednesday nights at 9:30 PM Eastern) and then release the podcast in audio form on iTunes. The show starts with a news story or event relating to social media ethics (ex. Facebook Timeline change). Then Justin and Ashley tackle some questions submitted by the listeners. Prior to each episode, they announce that weeks question to the listeners and invite the audience to record a YouTube video with their opinion on the topic. Justin and Ashley then choose their favorite response and play it at the very end of the show. The last episode was recorded on their Justin.tv feed on October 26th, 2011. Scheduling issues has been cited as the reason that the show has gone off the air, but it seems that they still intend on someday reviving the show. This page was last modified on 29 March 2012, at 19:24.